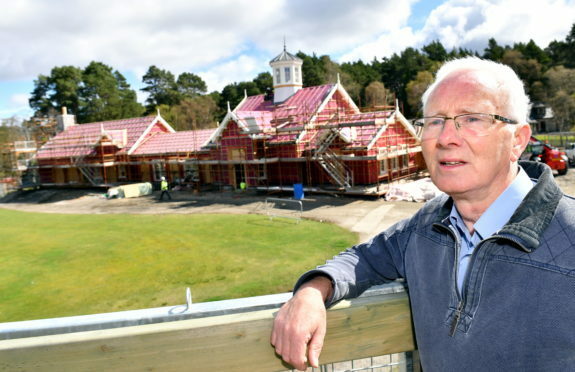 Aboyne Highland Games will hand over the cash to the new World Highland Games Centre in Braemar, which is due to open next month. The £2.5million centre, which is being built next to the Braemar Gathering arena, will tell the story of the traditional sports and also attempt to preserve them for the future. The facility will incorporate a gallery, exhibition hall, cafe and gift shop. The Aboyne organisers’ donation is designed to help with cataloguing archive material at the site. David Geddes, president of the Braemar Royal Highland Charity, said the funds would support a vital aspect of the project. He said: “We remain on track to open the first phase of the centre this September. Certain elements will follow thereafter. One such element is the archiving of over 200 years of Highland Games history, which is a large and important project, but work is under way. The centre has been supported and managed by the Duke of Rothesay’s charity, the Prince’s Foundation. This year’s Aboyne event takes place next Saturday on the village green from 10.30am. Alistair Grant, chairman of the games, said: “The World Highland Games Centre is set to be a fantastic new year-round asset for Royal Deeside. It will provide a venue that educates and informs the public and brings Highland Games together to celebrate their unique and deep-rooted contribution to Scottish history and culture.